The days are finally brisk here in Los Angeles. We had such a stifling summer that most of us are thrilled to see our breath in the cold air now. Today was the first sweater, scarf and gloves day for me which felt like such a special treat after having to run the air-conditioner for months on end. If you're a cozy girl like me, you're going to love this new giveaway! Bea, from Foldi, creates unique shawls, scarves, cowls and other knitted accessories from luxurious yarns. I fell absolutely in love with her lush accessories and am so excited that she offered to give the above cowl away to one lucky Haute Whimsy reader! For a chance to win, please visit the shop and leave a comment below letting us know which other item you love most from Foldi (mandatory). *Congratulations to our lucky winner, Sofia! My favorite is Knitted mohair cowl, snood in grey purple, mauve - absolutely amazing color!!! I'm a secret admirer of Foldi on Etsy. Oooh, I'm in love with this cowl. 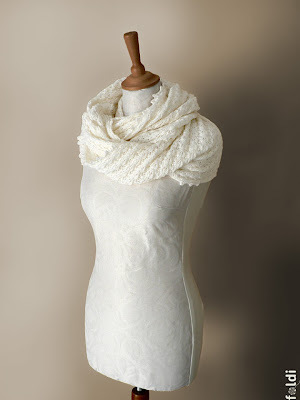 I also love the knitted mohair scarf in cream! Foldi is a Favorite on Etsy! I like the knitted mohair scarf in teal blue. I favorited Foldi on etsy (MissRebeccaF). I follow the Foldi blog with GFC. I follow Haute Whimsey with GFC. I favorited Haute Whimsey on etsy (MissRebeccaF). I follow Haute Whimsey on twitter (@RebeccaFH). I like Haute Whimsey on Facebook (Rebecca F.H.). The knitted merino wool mobius scarf looks extremely comfortable...love it! I like the knitted turquoise bamboo lace scarf shawl. Lovely color! either the maroon or teal! Love her Knitted turquoise bamboo lace scarf shawl! I really love the one being advertised...it is sooo feminine! knitted merino wool mobius scarf in cream! I love the Knitted storm blue silk and mohair lace scarf stole 'Butterfly' SO MUCH!! My favorite item is the dusty pink snood. I love Knitted silk and mohair lace scarf in cream colour! I like the Knitted merino wool möbius scarf, cowl, snood, wrap in burgundy red colour! Love the cream merino mobius scarf. I love the knitted angora blend cowl in light pink colour "hearts." Thanks! I love the wool baby booties but I also love the knitted merino wool lace scarf in cream colour "Butterfly"! I like Foldi on facebook! Katy A.
I am following Foldi on pinterest! katy010305 Katy A.
I follow Haute Whimsy on pinterest! katy010305 Katy A.
I like Haute Whimsy on facebook! Katy A.
I like their Knitted mohair cowl, snood in dusty pink! Thanks so much for the fantastic giveaway! I Favorited Foldi on Etsy! Thanks so much for the fantastic giveaway! I favorited Haute Whimsy on Etsy! Thanks so much for the fantastic giveaway! I follow you on Twitter as ReneeWalters7! Thanks so much for the fantastic giveaway! I like Foldi on Facebook as Renee Walters! Thanks so much for the fantastic giveaway! I follow you on Pinterest as bored2quickly! Thanks so much for the fantastic giveaway! I follow Foldi on Pinterest as bored2quickly! Thanks so much for the fantastic giveaway! The grey silk and mohair cowl is my favorite. Love the brown and blue knitted baby booties. Will definitely keep this in mind next time I've got a baby shower to go to. I love this: http://www.etsy.com/listing/111225627/knitted-mohair-scarf-in-pistachio-green. Such a lovely color too! The Knitted mohair cowl, snood in light grey blue is just beautiful! Oh, was it hard to choose a favorite! I fell in love with one scarf after another, one more lovely and fine after another. However, I ended up choosing the Knitted Baby Blanket as my favorite because it was so unique and just as desirable! Lovely, all of them. I favorite Foldi on Etsy. favorited on Etsy as SoliloquyShoppe! I adore the Knitted mohair scarf in teal blue!